What’s Up With Russia’s Mysterious Il-76 Airlifter Over Syria? Has Moscow been using private contractors in its Syria military buildup? On Sept. 15, 2015, right in the middle of Russia’s military buildup in Syria, a plane appeared on Flight Radar, a Website specializing in tracking planes all over the world. The Il-76, a Soviet-era transport plane, was briefly located south of Homs, heading east, before disappearing. The plane was registered under a Kazakh charter flight company called Air Almaty. When one searches the registration number in Flight Radar, it shows only one flight, on an incoherent route near Jordan. No flight is shown going through Syria. Moreover, the position of the plane matches with several known flights conducted by the Russian air force in the month of September. On Sept. 8, a Russian blogger — whose account has since disappeared — noticed an Il-76 going from Latakia’s airport to Moscow and passing through a position very similar to the one seen on Sept. 15. 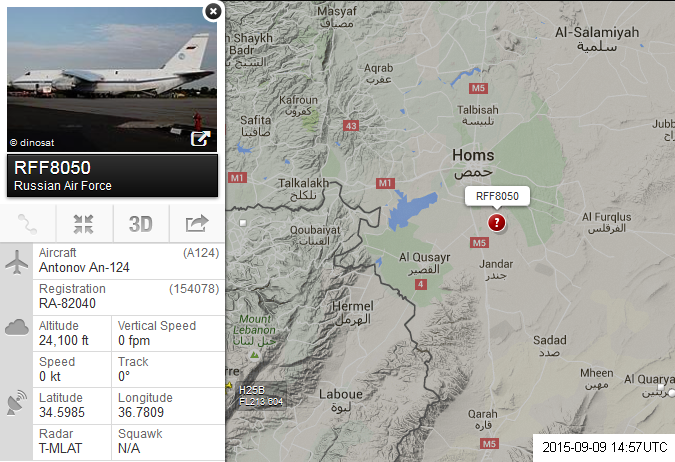 A day later, an An-124 of the Russian air force was seen south of Homs, at almost the same location. Though the Il-76 could theoretically have been coming from Turkey — many planes that take this route pass south of Homs — it is also very much possible that the aircraft came from Latakia’s airport, Russia’s epicenter for its bombing campaign against the enemies of Syrian president Bashar Al Assad. Indeed, on Sept. 15, satellite photos of the airport in Latakia shows an Il-76 on the tarmac, although it is impossible to say if this is the aircraft Flight Radar located. The company to which the plane belongs, Air Almaty, seems to link back to Russian individuals. Air Almaty is registered as a Kazahk company, but one individual named Sergeev Oleg Vladimirovich owns 49 percent of it, according to the Kazakh company registry. Vladimirovich is also mentioned as the creator of ZetAvia, a Ukrainian charter flight company, in the Ukrainian state registry. Indeed, ZetAvia’s Website mentions the aircraft located over Syria in its “fleet availability” page. The page also says that the plane is based in the United Arab Emirates, more specifically at Fujairah’s airport. Kazakhstan, where Air Almaty is registered, also has a special reputation regarding air companies. In a book about ex-Soviet smugglers, investigative journalists Matt Potter writes that “one of the reasons Kazakhstan was so popular as a plane-registration base for dodgy outfits — apart from the fact that they let anyone register — is that its call sign was always Unicorn November, meaning all Kazakh-registered flights began with the letters ‘U.N.,'” which, according to the author, made it easier to fool naïve air controllers in remote airports. Indeed, Air Almaty’s track record isn’t amazing, considering it’s one of 19 Kazakh companies forbidden to fly in European air space. There are indications that the people behind Air Almaty and ZetAvia are from Russia. The two individuals mentioned on the registry of Ukrainian companies are both registered in Russia — one in Ekaterinburg, the other in the city of Kolomna. Moreover, the Kazakh company registry describes Sergeev Vladimirovich as a “non-resident,” implying he is not from Kazakhstan. Air Almaty and ZetAvia are linked to a third company, Reem Travel. According to its Website, Reem Travel acts as the commercial agent of the other two companies. They claim to have created ZetAvia “from scratch” and are based in the United Arab Emirates, where the plane located above Syria is allegedly based. Individual links between Reem Travel and the other two companies are also clear, strongly implying that all three companies were created by the same group of people. In a 2011 report by a Chinese aviation service about Air Almaty, Sergeev Vladimirovich’s mail address is mentioned as being “manager@reemtravel.com.” Moreover, one of the directors of Air Almaty, a man named Igor Kochkin, is also mentioned in a database of Arabic supply chain companies as being the “marketing director” of Reem Travel. The use of private companies in military operations is nothing new, especially in the field of logistics. Volga Dnepr, a Russian charter flight company, regularly works with armies around the world to transport weapons and equipment — as it did with the French army during its deployment to Mali, for example. They are usually used when the military doesn’t have the logistic capabilities necessary for an extended operation abroad. They can also discreetly move people or equipment. In a 2005 article, The New York Times showed how the CIA used a private charter flight company to transport prisoners to foreign countries for interrogation. The article mentioned that the private planes were especially useful when operating in countries not especially favorable to the United States. With so little information, it’s difficult to say exactly what this plane was doing in Syria’s air space. The fact that it appeared at the time of Russia’s build-up in Latakia, along with its position — on the path of many Russian aircraft that landed in Latakia’s airport — make it possible that it was part of Russia’s deployment in the country. However, it could also have been resupplying the Syrian army, or fulfilling some non-military purpose.